Interested in earning the 500 million won bonanza instantly? Open your eyes wide, and look for a gentleman who is 99% copy of Col. Sanders of Kentucky Fried Chicken. Candidates for the opposition New Politics Alliance for Democracy are leading the key three regions in Korea, Seoul, Incheon and Gyeonggi Province, for June 4 local elections, according to the latest poll. In Seoul, the NPADs incumbent mayor Park Won-soon has a clear lead over ruling Saenuri partys Chung Mong-joon, with 51% vs. Chungs 35.4%. In Incheon, the incumbent candidate from NPAD is leading by comfortable 10%, while it is neck and neck with less than 1% gap in Gyeonggi Province. Chung Mong-joon, the chairman of Hyundai Heavy Industries, used to have a slight lead over Park Won-soon, but had to watch his popularity drop because of his teenage sons comment on his Facebook after the ferry disaster. He wrote Koreans must be uncivilized to throw water bottles at the Prime Minister, and swear four letter words at the president who were at the scene to urge quick rescue effort. 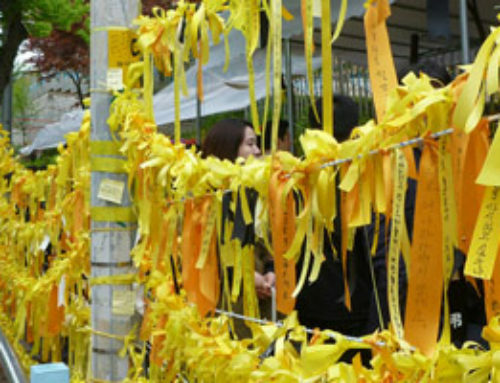 Experts think the ruling party and President Park Geun-hye are bearing the brunt of public anger over the ferry disaster. Opposition party leader claims that president Park Geun-hye has to be totally responsible for the Apr 16 ferry disaster. As there has been no ferry accident since then, the president must be doing a pretty darn good job these days then. President Park Geun-hye attended the event celebrating the installation of a Korean made nuclear reactor in U.A.E on May 20. Built by Doosan Heavy Industries, the reactor is the first to be exported overseas. Korean companies have won U$18.6 billion worth of orders for 4 reactors until 2020. The two countries made diplomatic ties in 1975, and the relationship got a momentum in 2009 when Korea won the deal to build four 1,400 megawatt nuclear reactors at $20 billion by 2020. After the ceremony, Park made a visit to a Korean military base near Abu Dhabi where Korean soldiers are training U.A.E forces as part of the nuclear deal. Kim Jong-un must be complaining why South Korea can make and export nuclear reactors freely, while he becomes an Adidas soccer ball in Brazil World Cup to do the same. Well, it would O.K if Col. Sanders has a knife in his kitchen, but not, if Ted Bundy has one in his pocket. Some 4.3 million Chinese tourists visited Korea last year, spending 3.75 trillion won with their credit cards, to Shinhan Card, an eye popping increase of 82.7% from 2012. The rise was especially notable in plastic surgery for which Chinese visitors spent 65 billion won last year, up 85% and accounting for 47% of total spending by foreigners at Korean hospitals last year. Others Chinese tourists spent more were skiing and leisure activities that went up 103%, superstores with 38% up and cloth boutiques with 31% increase. K-Pop culture has become very popular in China. When actress Chun Jee-hyun whispered to her boy friend man in a Korean soap opera titled You who came from stars, saying Chicken with beer is the best on a snowy day in Feb this year, the demand for chicken and beer up went up so high all over China that there were as many as 3 hours of long lines in chicken restaurants in China, a good thing for Chinese chicken restaurants which had been suffering from bird flu epidemic. Col. Sanders has lost his public enemy No.1 status to the pretty Korean actress among Chinese chicken. Kia Motors announced its global sales will surpass the 30 million milestones this month, 52 years after its first three wheel light truck K-360 rolled off its Sohari plant near Seoul in 1962. As end of this April, Kia had sold 29.9 million vehicles. Kia surpassed sales of 10 million in 2003 and 20 million in 2010. Its subcompact Pride, which was introduced in 1987 and sold in the U.S as Ford Festiva, was its best seller with 3.46 million units sold. Ironically, Kias growth in sales got stronger since it went belly up, and then bought by Hyundai in 1998. My family owes a lot to the K-360 as it was what my father had driven to deliver goods in the 60s and 70s to bring bread for the family. As per K-360 name itself, K is not from Kia, but from a Mazda model code. What about 360? It is not from 360 degree panorama view, but from its 357cc engine displacement.